“There is no way you would ever think that is going to happen,” said I.V. Deli Mart owner Michael Hassan. One of the victims was fatally shot inside the store. Residents and business owners in Isla Vista were left reeling on Saturday after six victims were fatally injured in a bloody shooting massacre in the beachfront student community surrounding UC Santa Barbara. One of the victims, Chris Martinez, was killed inside I.V. Deli Mart on Pardall Road. Martinez was born and raised on the Central Coast, his father said. 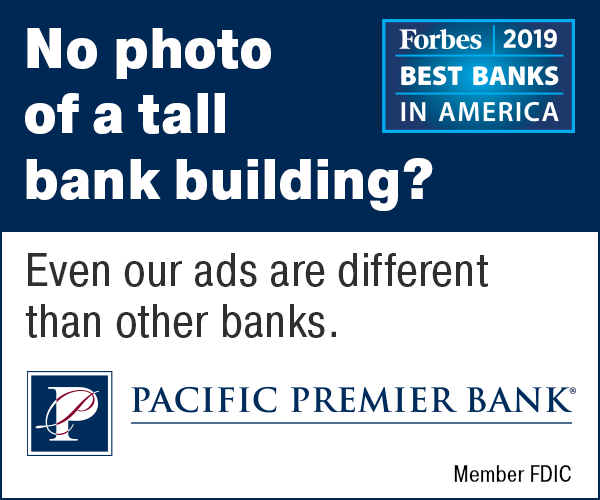 He was studying English at UCSB and planned to go to law school, his father, Santa Maria attorney Richard Martinez, told the Business Times. “He was a very good student,” he said. Rodger is believed to have stabbed three UCSB students to death in his apartment on the 6500 block of Seville Road to death before starting a shooting spree that killed three more people in the college town. The first three victims were Chen Yuan Hong, 20, of San Jose, George Chen, 19, of San Jose, and Weihan Wang, 20, of Fremont, police said Sunday afternoon. Hong and Chen were tenants in the apartment. Investigators are still working to determine if Wang was also a roommate or was visiting the apartment. He then shot UCSB students Veronika Weiss and Katie Cooper, who were standing outside, before shooting into the I.V. Deli Mart, claiming the life of Martinez. 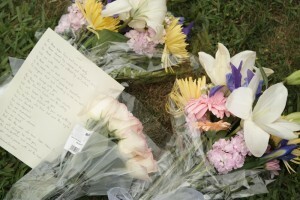 For more detailed coverage of the shootings, click here. For photos of Saturday night’s vigil, click here. Hassan, who was not scheduled to work on the night of the incident, said he received a call around 9:30 p.m. from the store manager, saying there had been a drive-by shooting. “We got two hits through the glass and one person was dead,” Hassan said. After fatally wounding Martinez inside the store, the suspect — firing from a black BMW speeding down the street — continued to fire more rounds of gunfire, Hassan said. Student Niklas Svennefiord told Daily Nexus reporters that he saw the suspect, a man in a white shirt, crash into a nearby black jeep. “I heard a couple gunfire shots — I thought they were fireworks — so I didn’t think about it, but I was pretty startled and then I heard a car hit into another car so I look up into my little window that’s in my shower and I see a guy try to flee and the cops shoot him,” he said. 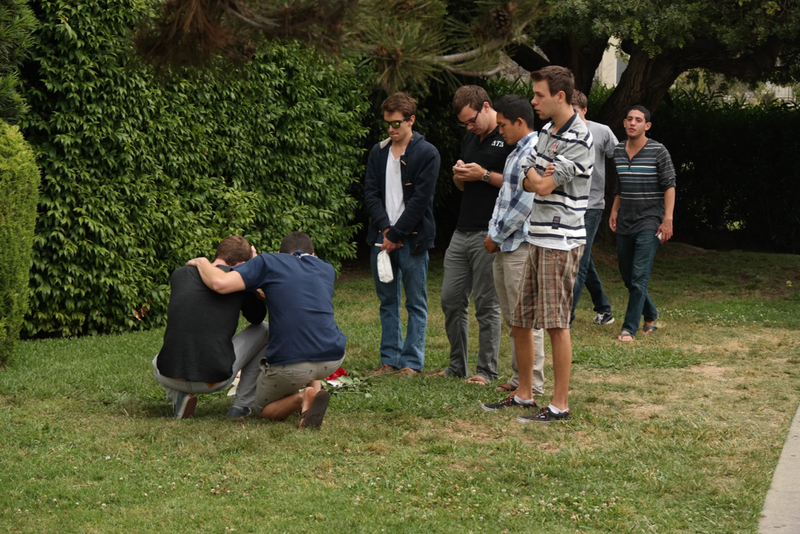 The Isla Vista community is in a state of shock and disbelief over what took place on Friday night. The small college town is a densely populated beachfront town and home to many UC Santa Barbara and Santa Barbara City College students, as well as working-class families. Although the college community is known for frequent and often rowdy partying, the university enjoys a reputation as a world-class research institution with a friendly and laid-back student body. The university said it has been working to provide support to its students and the community. “Those efforts will continue today and throughout the coming days and weeks. In addition to counseling services, the university is providing temporary housing for displaced students,” it said. 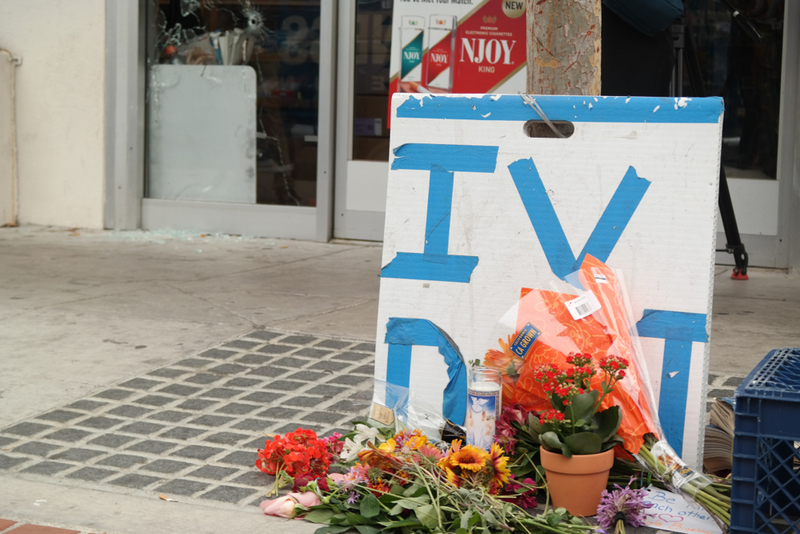 The Isla Vista community reacted on Saturday by placing flowers and memorials around town. 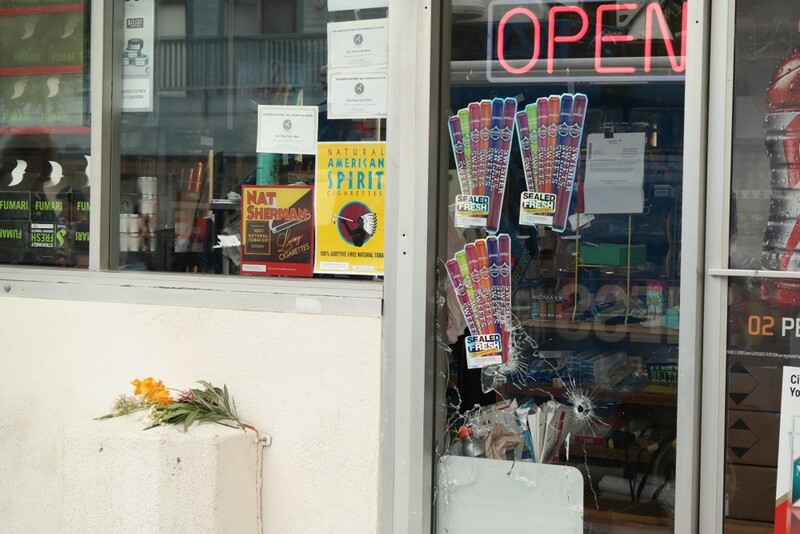 A memorial erected Saturday afternoon in front of IV Deli Mart contained a note that urged people to “be kind to each other.” Flowers and notes were also left on the lawn of a sorority house in Isla Vista that was allegedly targeted by the gunman. Earlier this year, the South Coast was rocked by Deltopia, an Isla Vista street party that soon turned into a violent riot with tens of thousands of people, many of whom appeared to be from out of town. The Deltopia riots resulted in mass property destruction and left several police officers with serious injuries. Last night’s shooting also recalled a similar horror in 2001, when a student named David Attias plowed his car into a crowded Isla Vista street, killing four people. 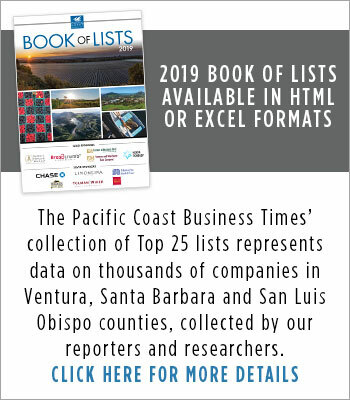 The largest mass murder in South Coast history was a 2006 shooting spree in Goleta, where a former postal worker killed seven people before taking her own life. 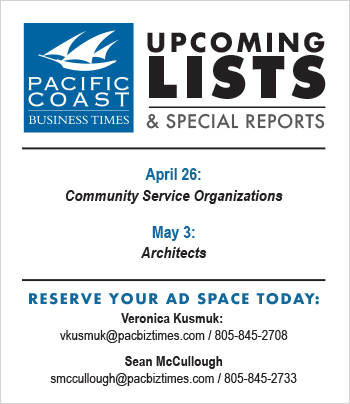 — Business Times intern and UCSB student Marissa Wenzke led coverage for this story. She is also reporting for the the Daily Nexus, the university’s student newspaper, which has given permission for the Business Times to use some of its coverage here. It’s said to say but had the police done there job when they were requested to do a welfare check on suspect those 6 people would still be alive, but that is only part of the problem. After the Sandy Hook tragedy, i sent a solution to the president regarding the gun control issue, the response I received back was a form letter saying bla bla bla. I have no money and no influence but I do have a great idea to help prevent tragedies like these. It’s time to quit talking and show some action. I want to say to Mr. Martinez, I hope you are angry enough to want to make a change? My thoughts are with you and the other families who lost loved ones. God bless us all. Thank you so much for reporting on this, Ms. Wenzke. It is such a tragedy, and my heart goes out to all of you there in I.V. Love and prayers to you all, and to all relatives and other loved ones of the victims.